Many bingo sites have free games for depositors to play on a daily or weekly basis and win cash or bonuses. Here you'll find a listing of the games offered. Feel free to add. Lucky Pick is free to players who have spent £2 in cash on the site from Monday - Sunday of the previous week. Spend the minimum amount on any game on the site and you'll be eligible to take part in Luck Pick the next week. Play every day Monday to Sunday and you could win anything from £5 bonus to £500 cash! 49 cash values are hidden behind the shutters and players must match up the values. Make a match and the prize shown is yours to keep and you may win more than once. On Sunday, if you haven’t won you’ll be able to reveal all the shutters to see what you could have won. Looks very cool! This is really an amazing site and has a huge community of players. This is one bingo site on my list that i would def play at if US players were allowed. Daily Free Game Brand New Daily Free Game! 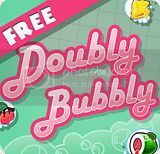 Log in each day to play Doubly Bubbly for the chance to win as much as £750 cash or up to 50 Free Spins! Enjoy a guaranteed win for free! 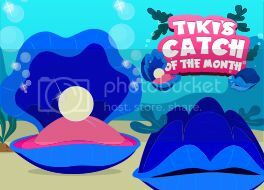 You can now scoop a guaranteed monthly prize of Free Spins or cash in their brand new monthly special game, Tiki’s Catch of the Month – and everyone’s a winner! Plays the last day of each month. See the site for more details. Collect and win with free games! Play Tiki’s Catch of the Day for a chance to win free spins. On each day that you play, you’ll rack up a special shell. Then come back on the last day of the month to open your shells and see your big score. Not a fan of fishing? Stay dry and play Search for the Phoenix. This free game is your shot at cracking open a big win. Collect an egg for every day that you play, and then come back on the last day of the month to see what’s inside. Thanks for sharing. Will try it for sure. Go Fish starts Monday 29th December. 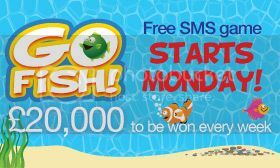 If you've already opted into SMS you'll receive a text with your code on Monday! If you haven’t opted into SMS register your mobile number in ‘my account’ and you'll receive a text so you can join in the fun. Terms apply. They've just launched a brand new Daily Free Game called Daily Paper! Play for your chance to win Free Spins on the Paper Wins Slot. Play today to unlock more papers for tomorrow's special game! You can play Daily Paper and another Daily Free Game for a limited time only until Sunday 4th September.